Our first Japan Rail Travel would be best described as ‘extreme sightseeing’ where we travelled ridiculous distances, to photograph stuff, only to travel ridiculous distances back again. The first day was an early example where we travelled 1,200 km, to photograph sakura blossoms in the northern parts of Japan, only to return to Tokyo again that evening. And this was just one day in a two week itinerary which covered close to 10,000 km, which is the equivalent of one quarter of the circumference of the world. We also did this on just $380US per person, on a two week JR pass (which I highlight below), so that’s around 26 kilometers per dollar. Bargain. Anyway, we were more or less nipping from one major city to the next, to north, to south, to east, to west, on the superfast Shinkansen bullet trains. Then, for shorter stretches, we’d use the local JR lines which we found were with very few limitations. On the rare occasion, where JR lines didn’t cover our journeys, we’d just pay the extra for local metros, train lines, buses, and the occasional taxi. Which were always short and cheap. Anyway, Japan Rail Travel proved so easy and efficient, that we just wanted to jump on a train at the end of it all, and disappear. Hokkaido? Which is new to me, as I’m often itching to leave after around the five day mark. But, with the comfort and ease of Japan Rail Travel, I could keep going indefinitely. Anyway, we are now returning for that adventure to Hokkaido next week, and again we have resorted to the Three Essentials for Japan Rail Travel which are the JR Pass, a Pocket Wifi Buddy, and the Hyperdia Route Planner. Other than obvious savings in Japan Rail Travel (which were obviously huge in our instance) we found a whole bunch of other perks when travelling on the JR Pass. For instance, if we missed a train, we would just bin the tickets, and get new ones for the next departure. There’s no penalty and you can literally get as many tickets as you please. Also, there is the perk of not having to queue at gates, as we just fast tracked past the ticketing offices, with a quick flash of our passes. So our passes just made travel ridiculously easy and stressfree as we would just turn up at stations and walk straight through to the platforms. I wouldn’t recommend rail travel in Japan without them. To get them, it is best to organise before arrival in Japan, as it’s cheaper and it saves the time and hassle when there, although we did go about this the wrong way with our first Japan Rail Travel. This is when we used a Bangkok based travel company, and ended up trolling through malls, with passports and lots of cash, to be stuck in long queues at kiosks. Instead, this time around, we ordered them online using www.japan-rail-pass.co.uk, and, more or less, they arrived to our door in very rural Thailand, just three days later. Then, when we arrive in Japan, we just swap over the reservations at the nearest JR office on arrival. Simple. This was a lesson learnt from our last stint, as we found out on the night we arrived that wifi and data connection makes travel a whole lot easier, and not having them frustrates what is otherwise a stressfree travel experience. As, on arriving, we found ourselves lost at Tokyo’s Bakurochō Station, where our hotel is based. We thought we were well prepared to be honest, with Google map screenshots from the station to our reserved hotels, but they neglected to tell us which station gate to begin with, and with six exits from the station to choose from, we found ourselves off in the wrong direction. After roughly twenty minutes we resorted to harassing a passerby for directions, and he pulled out his phone to instantly show us where it was. Yet we continued to get lost anyway. So it was a frustrating night, and many followed without access to the internet. So, second time around, we have instead arranged for a pocket wifi buddy, to be delivered to our first hotel on arrival, and it will then returned by mail when leaving again at Osaka Airport. It’s cheap, simple, and it’s a guaranteed lifesaver. And not only with travel, and directions, but hotel reservations, complications, and it will work with all our laptops, tablets, and phones, at the same time. This means we can edit and share photos on the go, and this keeps us busy on the many long-haul Shinkansen journeys ahead. And I can pick up the region locked Farfetch’d on Pokemon Go. The website which we used to put our Japan Rail Travel itineraries together is Hyperdia which covers every single train that runs in Japan. It gives route options, the quickest times, and the varying prices (although the latter is irrelevant with the JR Pass). It also differentiates between the JR Pass options (lines owned by Japan Rail) and those which are not included on the pass. Again it helps with onward travel, highway busses from ports of arrival. It’s just simple and indispensible for rail travel in Japan. It is also ridiculously accurate, because Japan Rail Travel is world-renowned for punctuality, and meticulous timing, as trains more or less arrive, and leave, exact on the minute. In fact, if there is a delay of more than 5 minutes, there will be a public apology, and if this is 20 minutes they will likely make headline news. Anyway, one thing we did get confused with Hyperdia was when navigating two stops on a local JR line (to Tokyo Station via the Sobu line and the Yokosuka line). This is when, during what looked like a transfer, we jumped off at the station to wait for the next train to arrive a minute later. But this doesn’t happen, as the train we were travelling on actually switched lines, and we didn’t need to switch trains at all. In hindsight there is a symbol highlighting this next to the transfer, but we missed it, so just be careful. Anyway, we ended up 20 minutes behind schedule, and missed our reserved seats, so we all we did was scrap those tickets, and pick up new ones for the next departure. 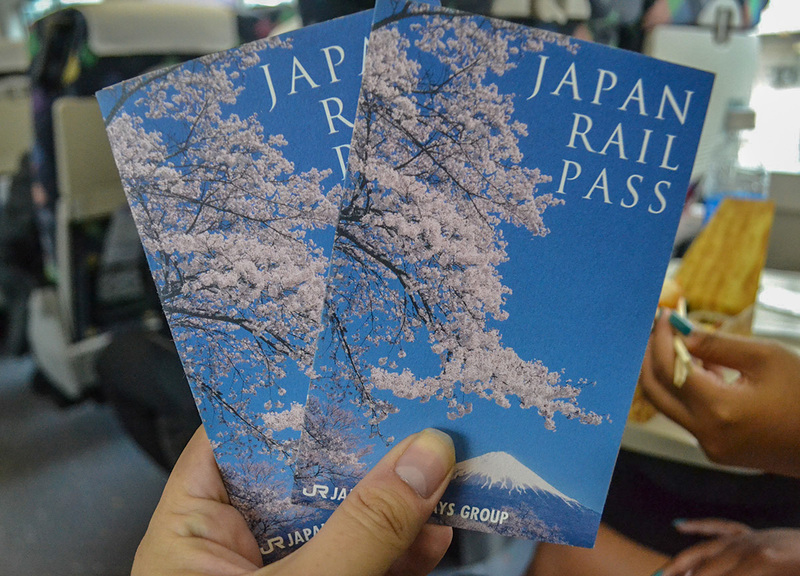 Which again is so simple with the JR Pass and Japan Rail Travel.